How do you counter any weight you might gain from eating pounds and pounds of homemade pasta?! 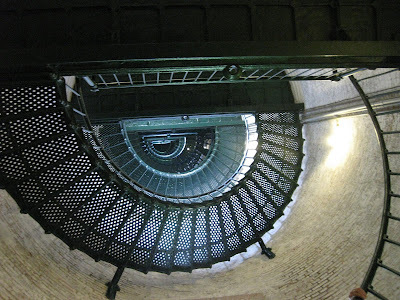 Climb (and descend) 214 steps to the top of the Currituck Lighthouse in 90° weather, of course!! Emma, Jordan, my mom, Taylor, and myself in front of the lighthouse, after climbing it. We also visited the Bodie Island Lighthouse, which is not open to climb. I still got my picture outside of it, though! The kids were also dying to try homemade pizza from my blog. I whipped up a few batches of Biz's pizza dough and we got to work! Taylor rolled the dough with a rolling pin that probably weighs as much as she does! We each had our own half to customize to our liking! There was a half batch of extra dough, so we made pretzels as a movie snack later that night. On the last 5am beach walk we finally got a sunrise! The sky seemed to change every second, reflecting off the water and the sand. That's it for my trip recap! If you'd like to see more pictures (or just be my friend), you can add me on Facebook! There's also a link on the right in the column to follow my blog on Facebook too! And I LOVED that last picture of you with the sun setting down..Gorgeous! WOW! I love all the pictures! That is one too many stairs for me... you definitely burned off those great looking pizzas! love the beach pictures.. so beautiful!!! Sent you a friend request! Why, oh why, do I not live there?! It's so beautiful.